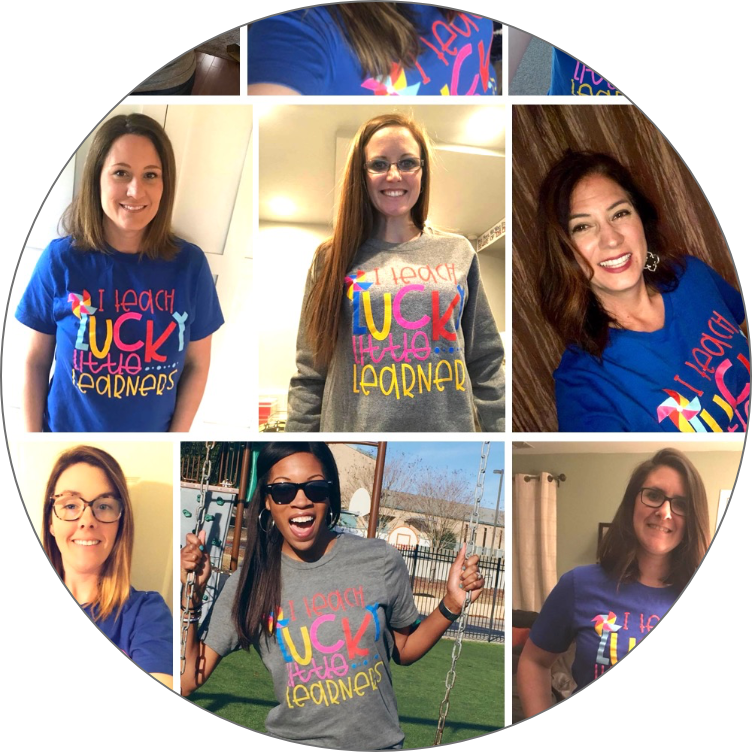 The end of the year can be tricky when it comes to keeping students engaged and learning. 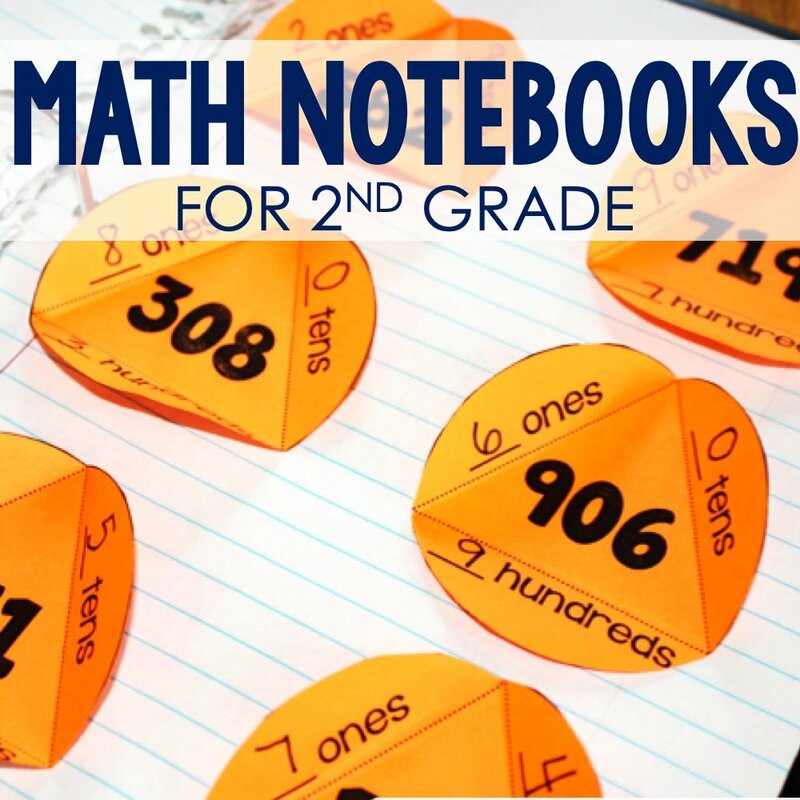 May math centers can be the perfect way to take your math block up a notch so you can keep your students learning through the end of the school year. Math centers is such an important time of the school day. 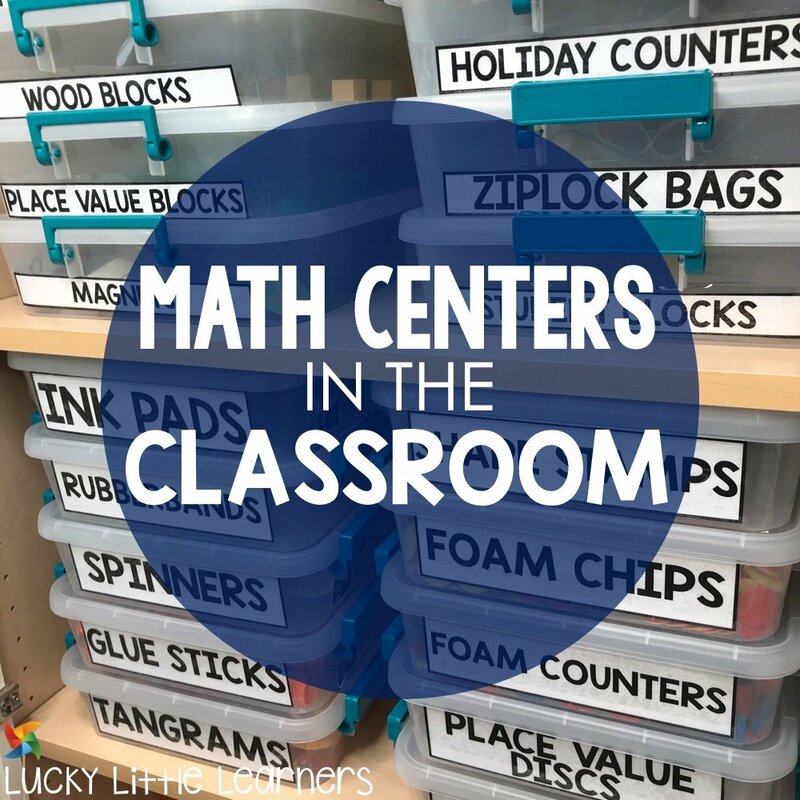 If you are curious about how to fit it in, how to decide which students to put in which group, how to structure your math block time, or how to introduce and implement math centers in the classroom, I have written a very detailed post about all of this that you can read here. 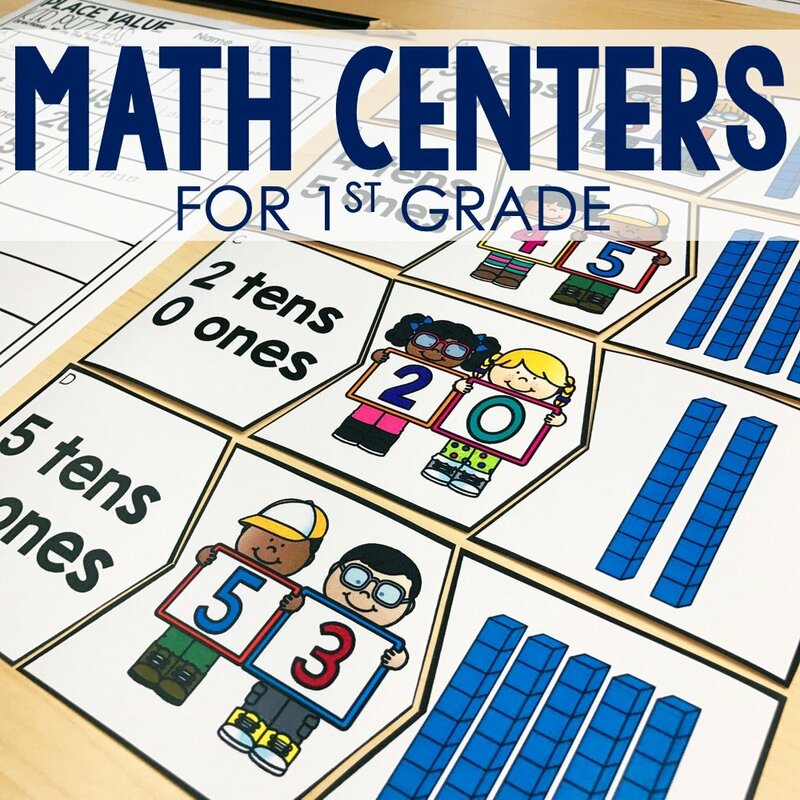 All of the math centers written about below can be purchased separately or as a bundle. The separate listings are available within each activity listing. The monthly and full year bundle links can be found below. Symmetry is a concept that is best taught with a hands on approach. 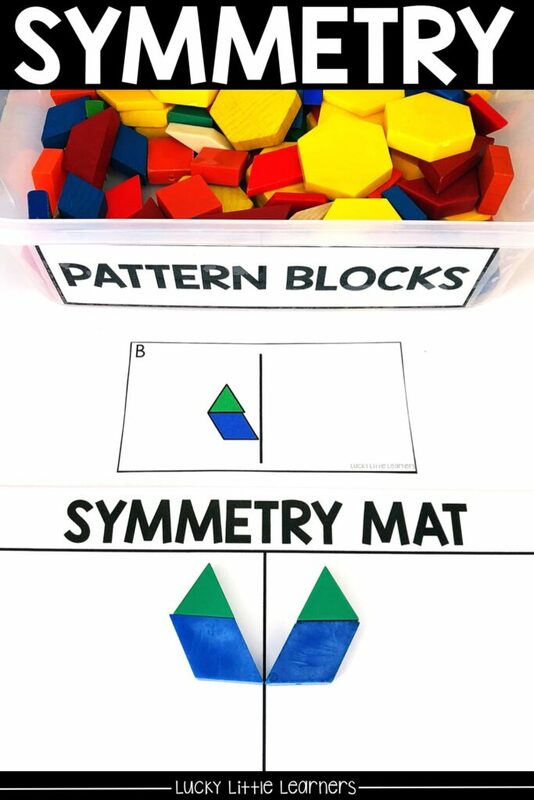 All that is needed for this activity is pattern blocks. 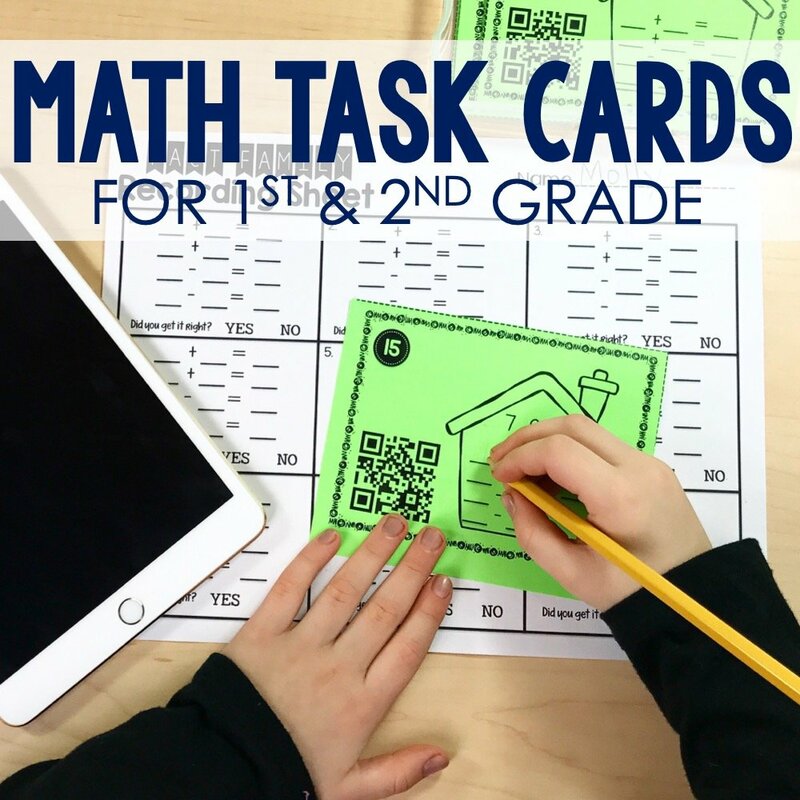 Students choose a task card and creates the shapes rom the task card onto the symmetry mat. Then students create the opposite side creating a symmetrical design. A recording sheet is provided for students to be held accountable for their work. To compose a shape means to use shapes to create a new shape. 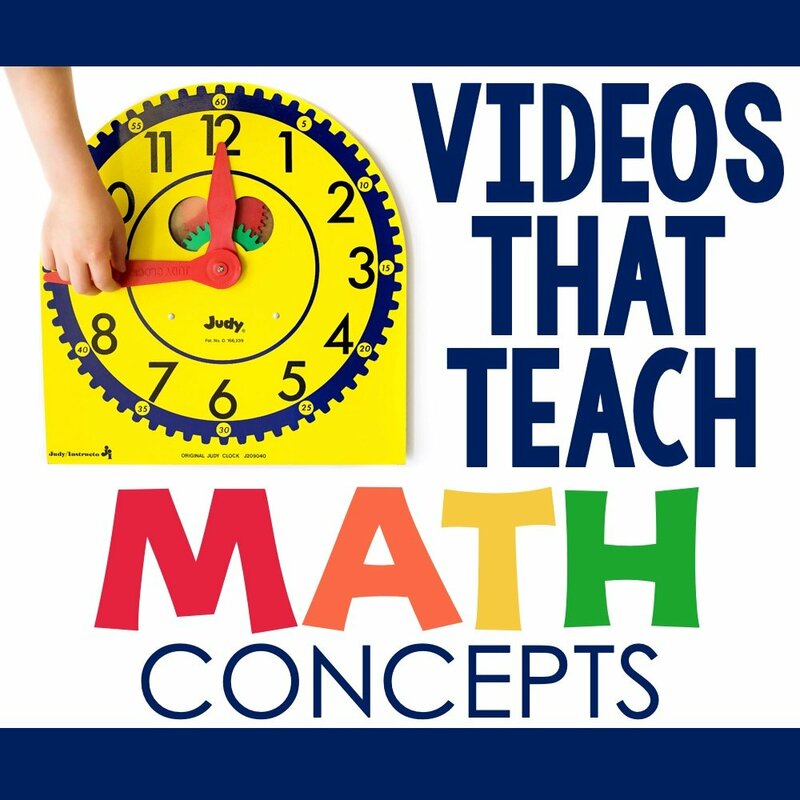 Composing shapes is an important math skill for students to master. 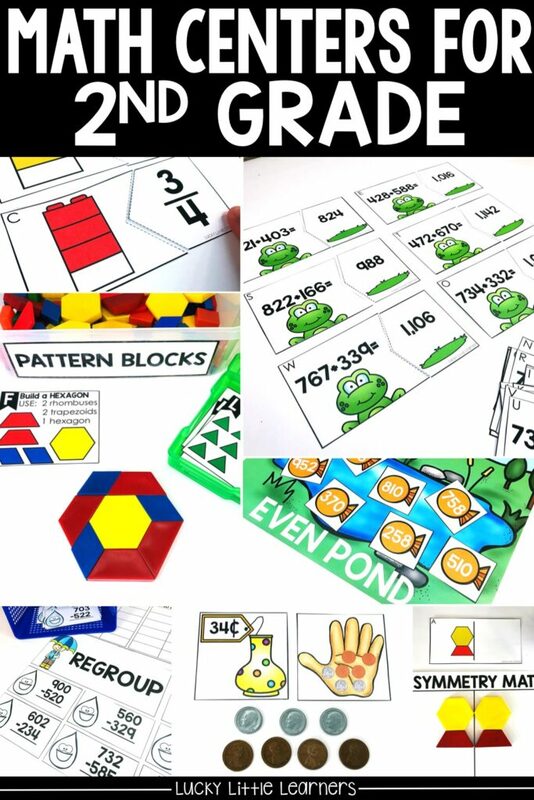 This can be achieved through the use of pattern blocks and task cards. 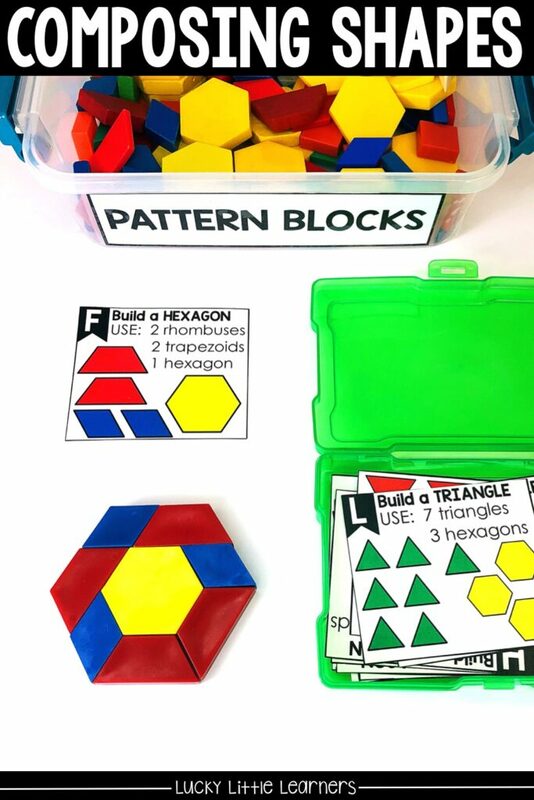 Students choose a task card and the pattern blocks to compose the new shape. 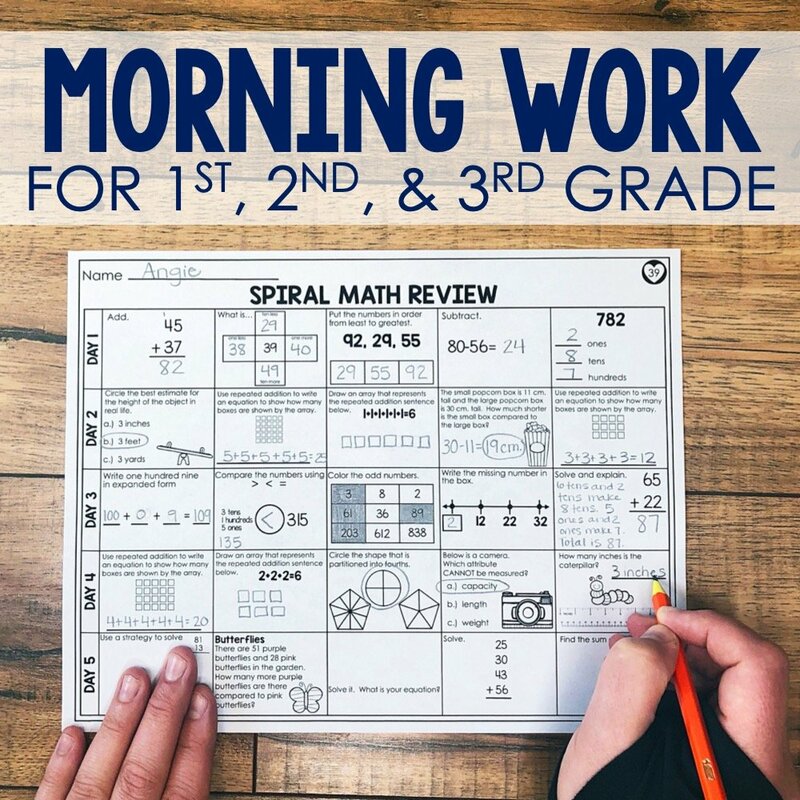 Once students compose their new shape, a recording sheet is provided for them to draw the shapes so the teacher can check for accuracy. 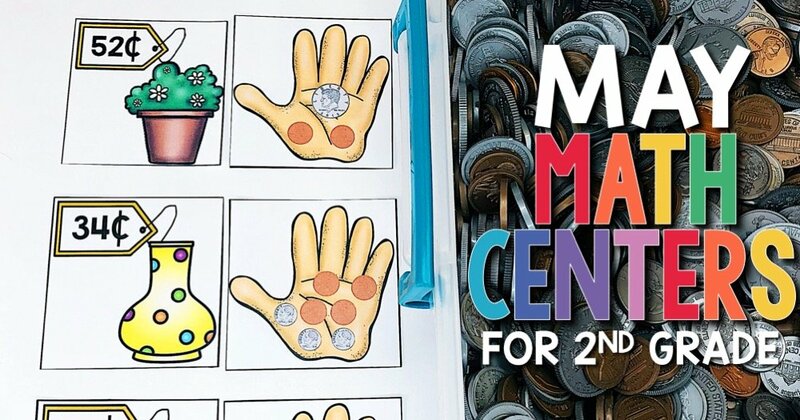 All that is needed for this Counting Money May Center would be the counting money matching card. Sometimes students benefit from manipulating the coins to count so this is also an option. 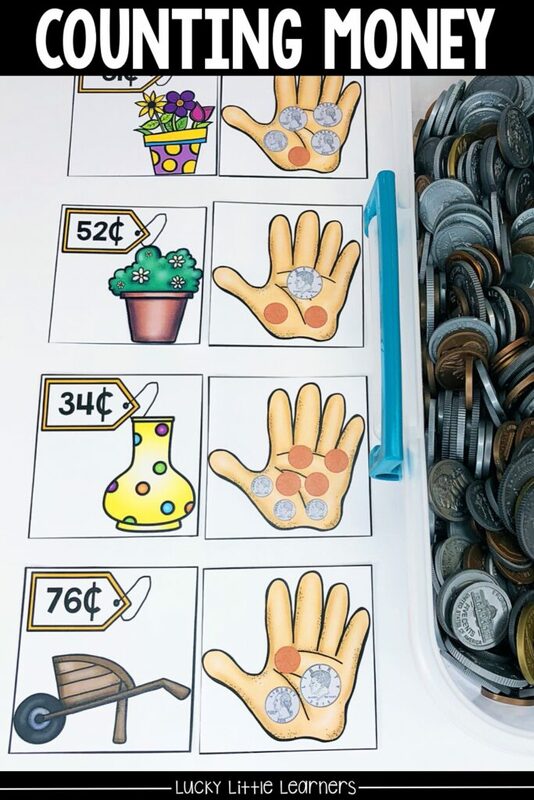 In this activity, students choose a card with coins and add to find the total. Then the students find the card that matches the coin total. Answers can be written on the included recording sheet for accountability. 2nd grade is the first time that students are exposed to learning the basics of multiplication. 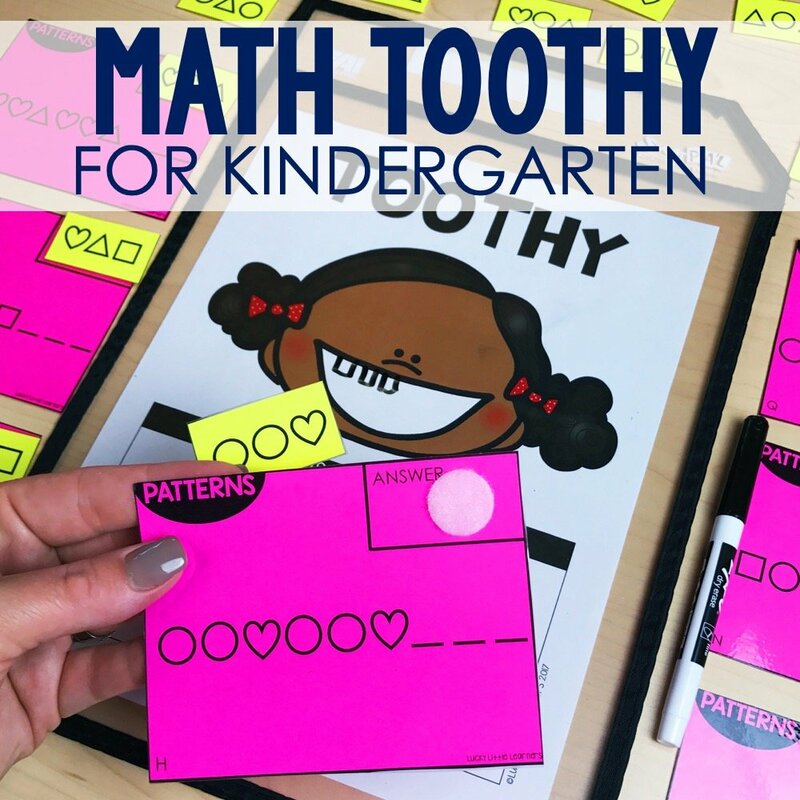 This can be done through exposure to equal groups, repeated addition, arrays, and basic multiplication problems. 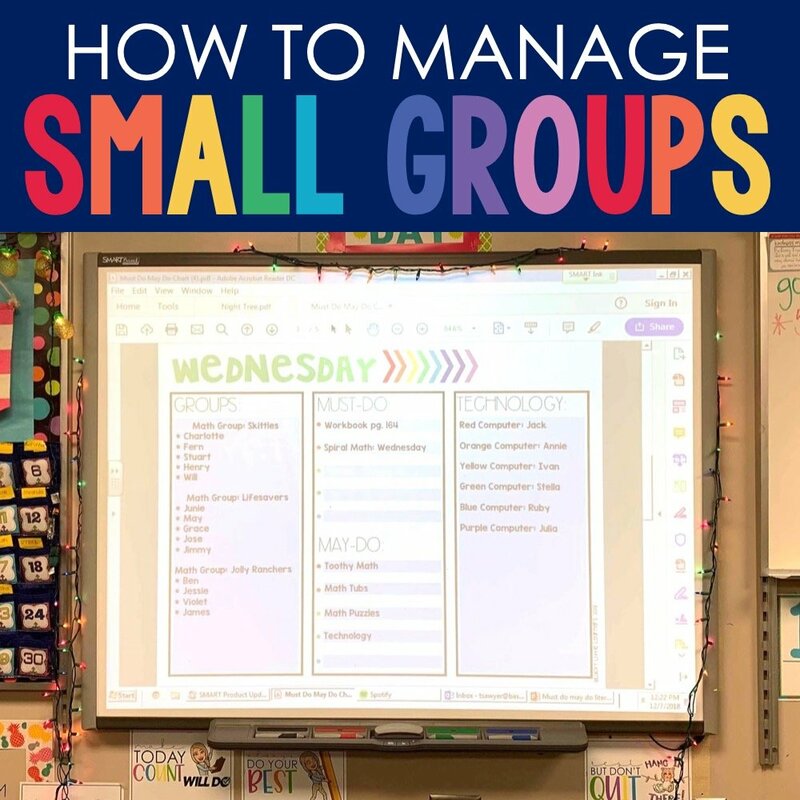 This activity involves students choosing an equal groups card. Then students find the matching card that represents the equal groups. Once the match has been made, the answer gets written on the recording sheet. Optional counters can be used to represent the equal groups or arrays. 2nd graders are required to tell time to the nearest 5 minutes. 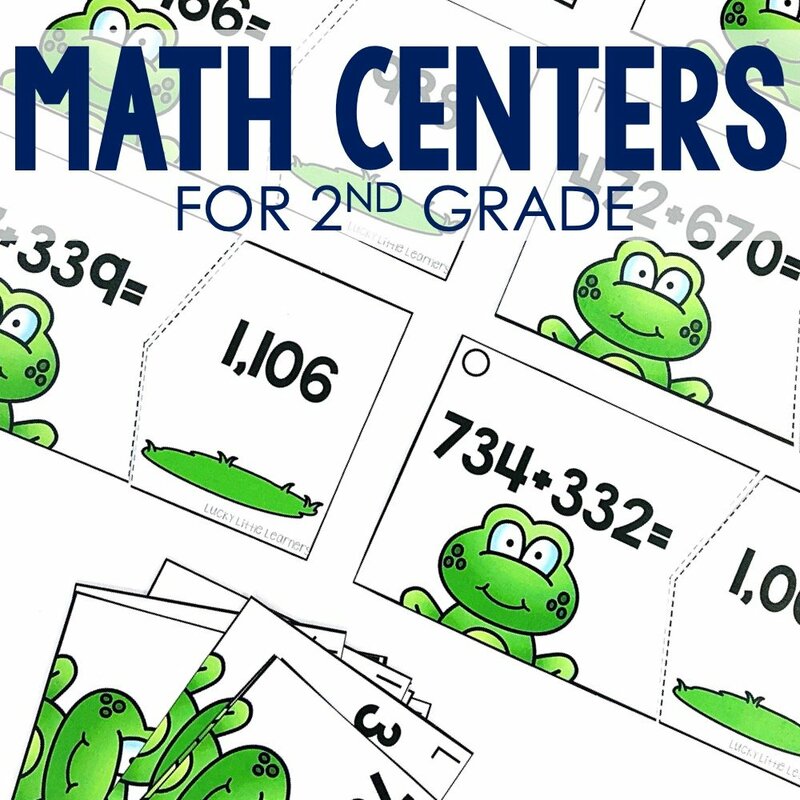 This math center is a matching center. 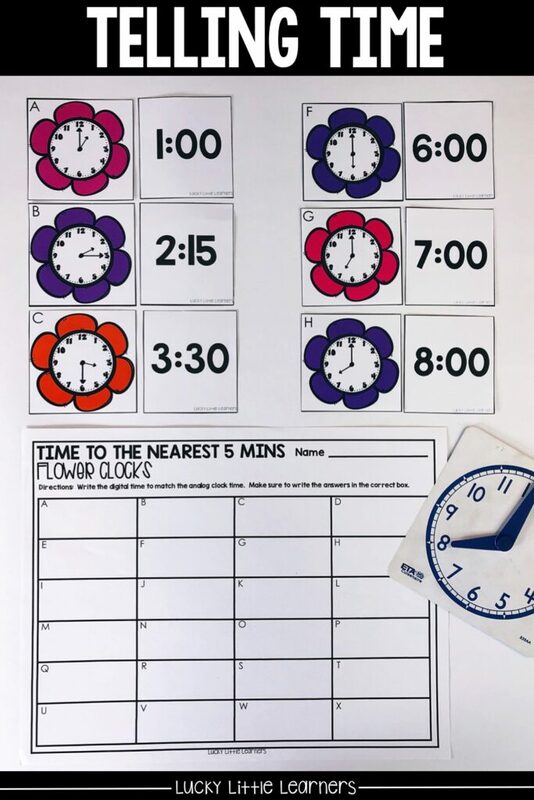 Students choose an analog clock card and determine the time on the clock. Then students find the matching digital time card. Answers get written on the recording sheet. 2nd graders learn about fractions through partitioning shapes into equal groups and determining the fraction for the shaded part of a shape. 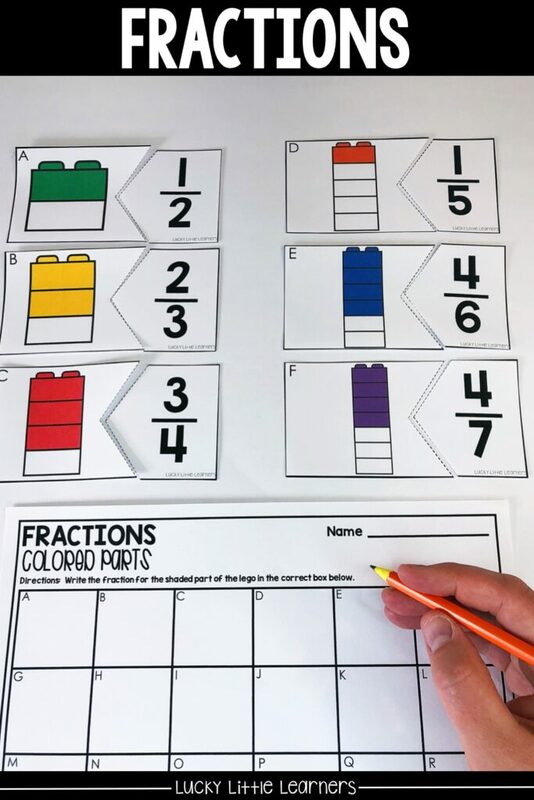 Kids love legos so why not combine fractions and legos?! This math center involves the student choosing a lego card and determining the fraction for the shaded part. Then students find the matching fraction card and writes the answer on the recording sheet for accountability. 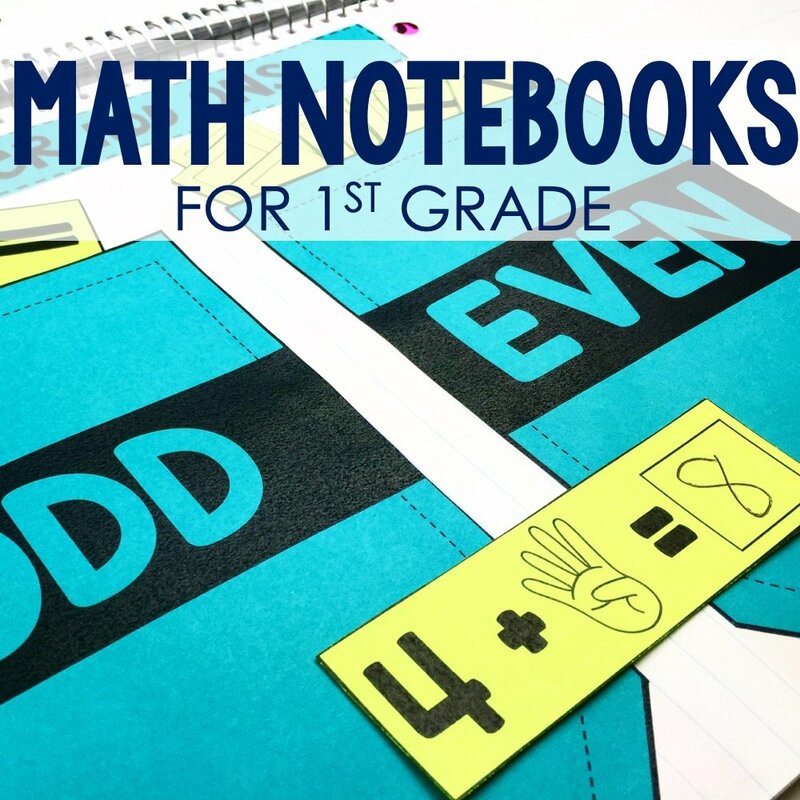 Once students have learned how to determine if a number is odd or even, they can move onto larger numbers. 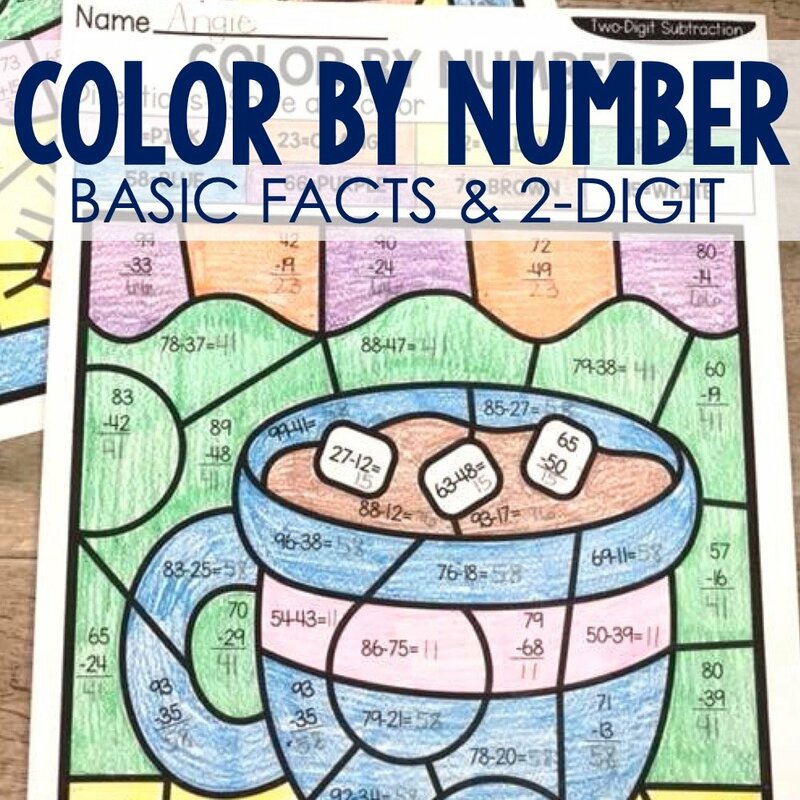 This odd and even number math center is fun! Students are given an odd pond and even pond mat. Then students choose a fish card with a 3-digit number. 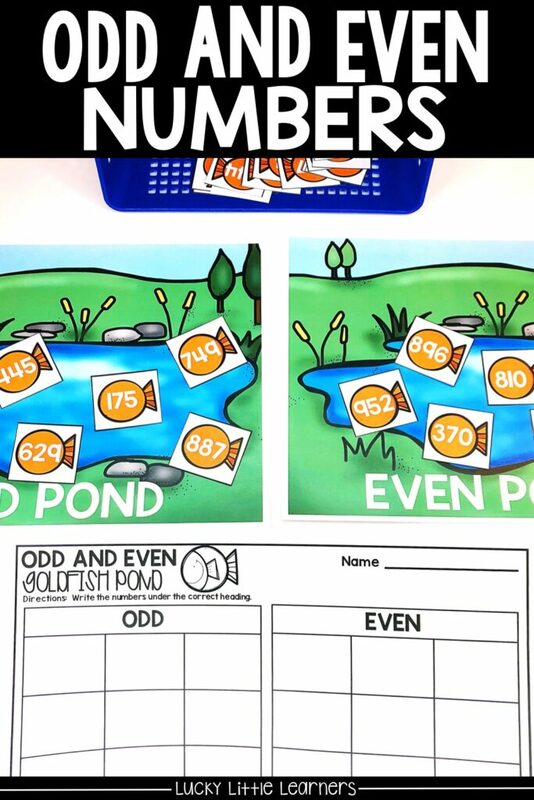 The fish card then gets placed on the correct mat and the answer gets written on the recording sheet. 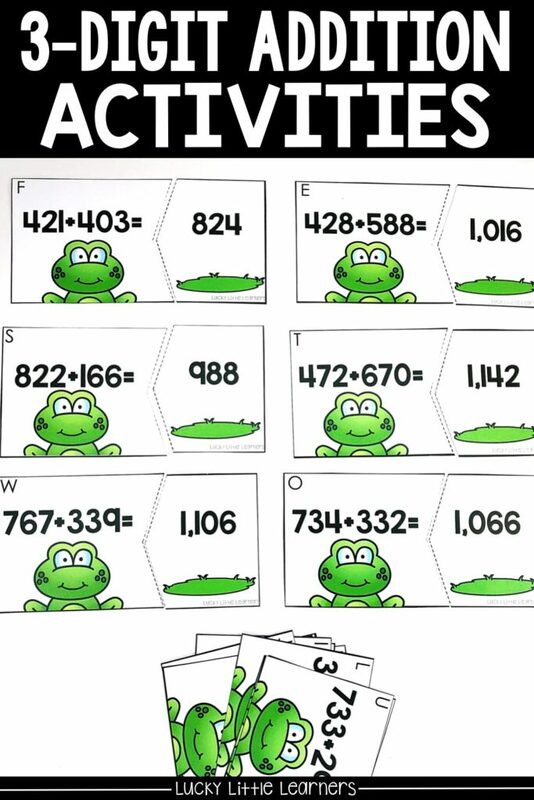 2nd grade is a huge year for students to learn to add and subtract multi-digit problems. 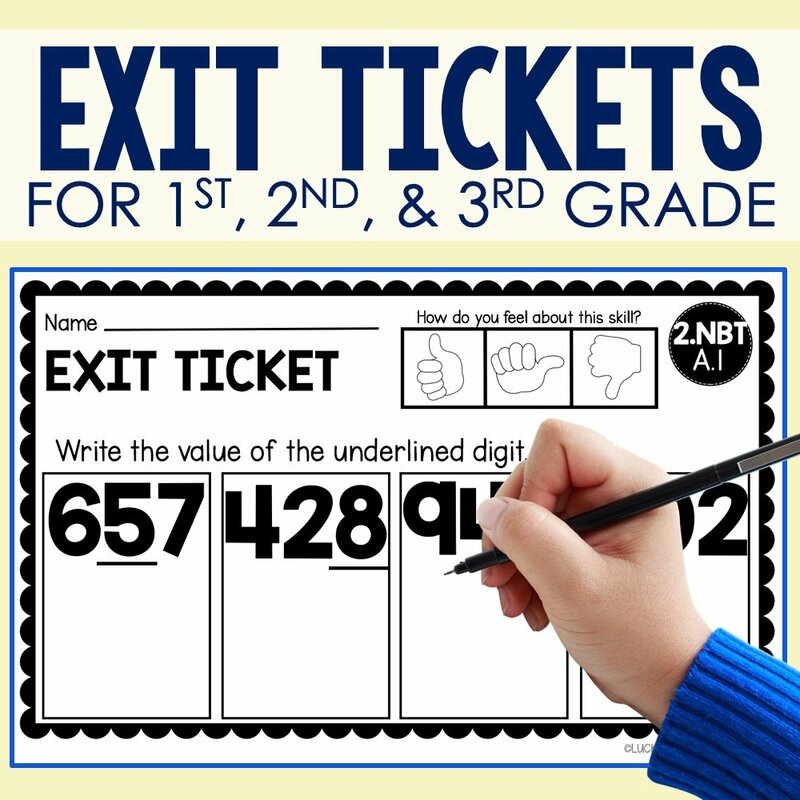 By the end of 2nd grade students should be able to add 3-digit numbers. 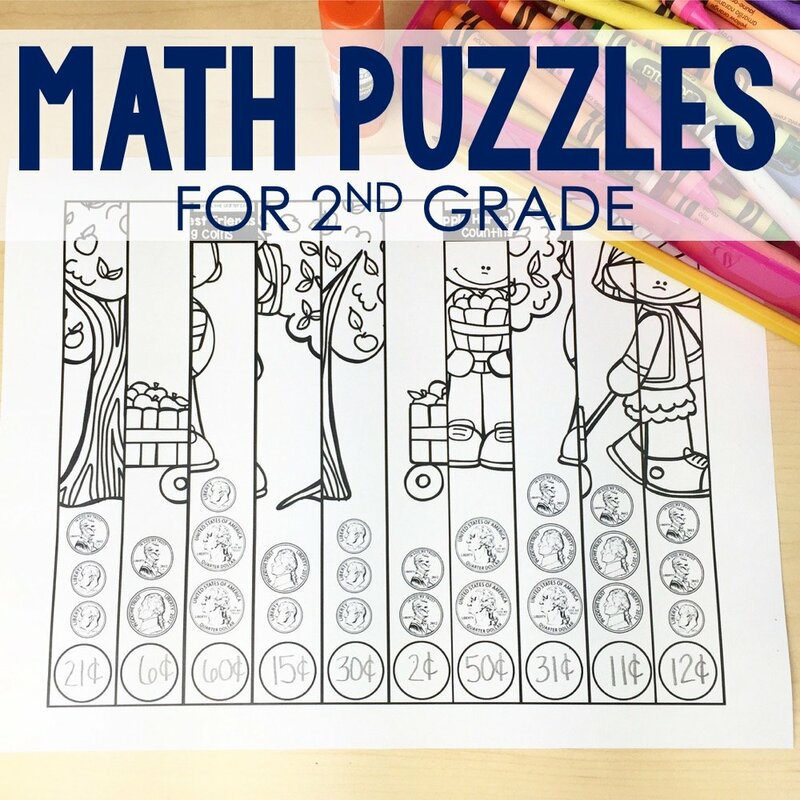 These math puzzles are a huge hit! 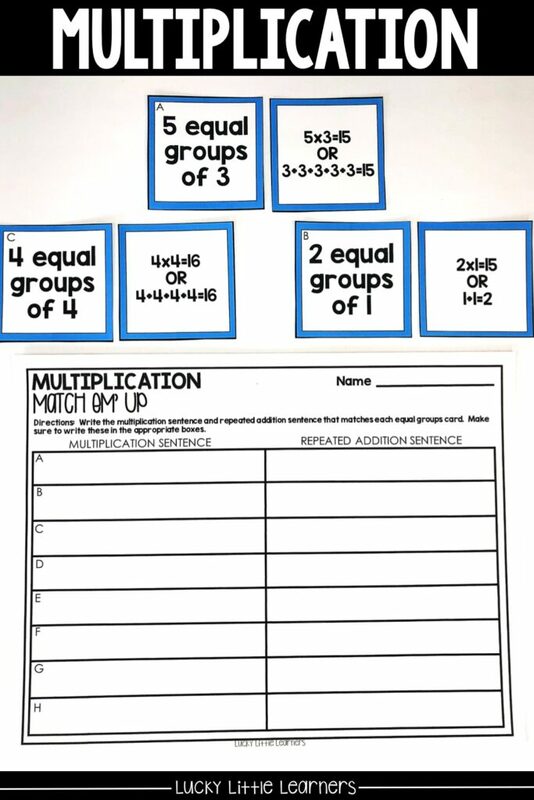 Students choose an addition card. 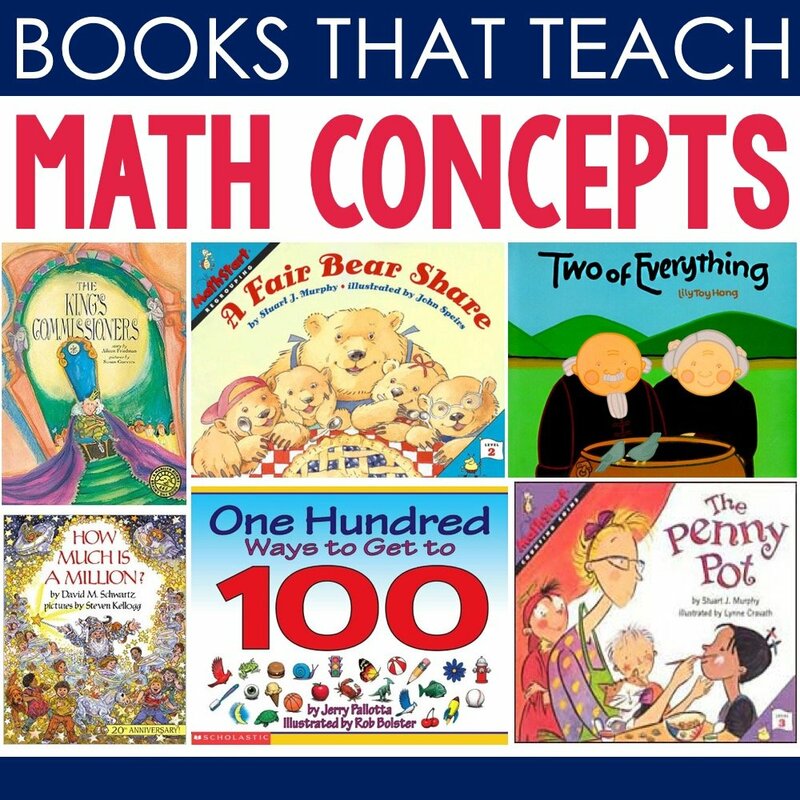 Students can choose to use whatever strategies they know to solve these problems. Then students find the answer card to match the addition card. Answers get written on the recording sheet. 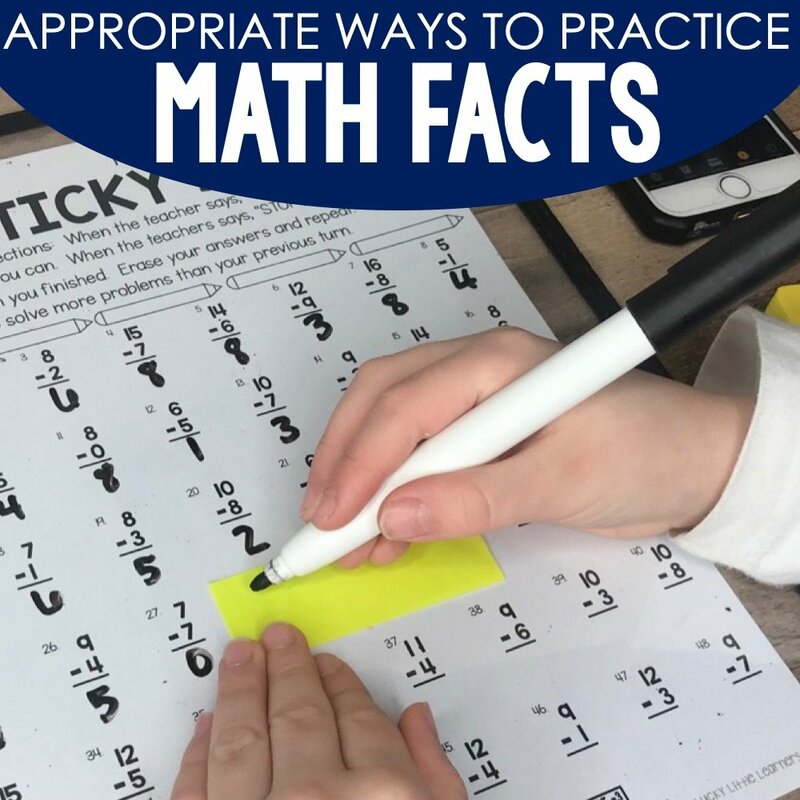 3-digit subtraction is another skill that 2nd graders need to be able to master before going into 3rd grade. Students choose a subtraction card and use whatever strategy they know to solve the problem. Then the answer gets written on the recording sheet. The subtraction card gets placed under the correct heading. 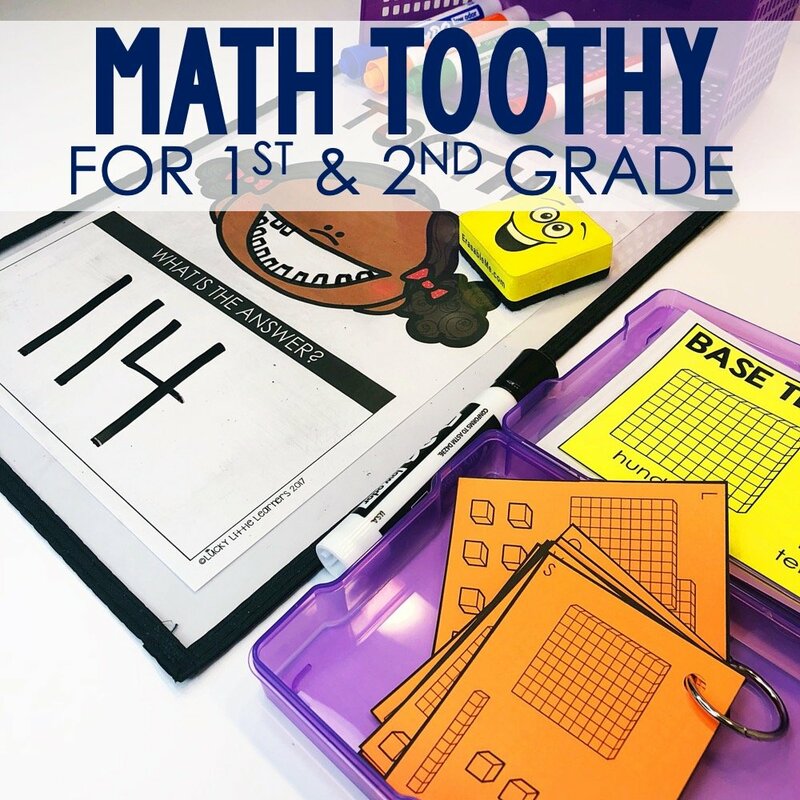 Place value is an essential skill for students to master in 2nd grade. 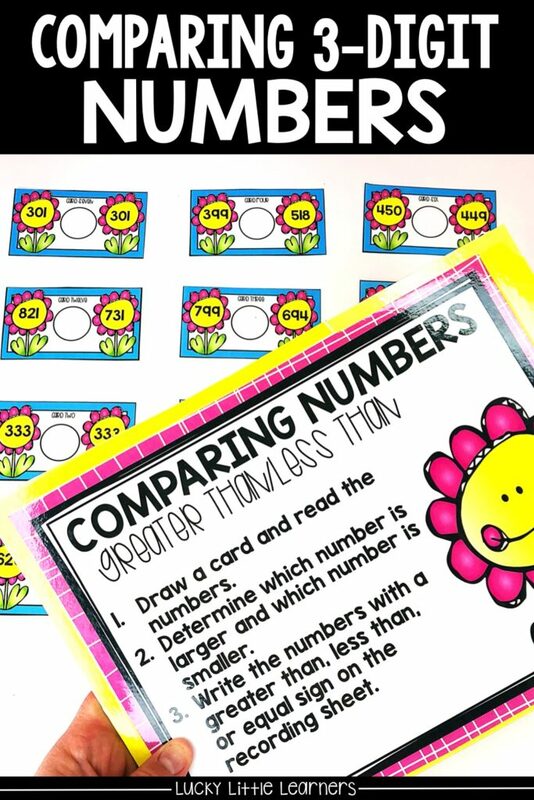 One of the place value concepts includes the ability to compare numbers by using a greater than, less than, and/or equal symbol. For this center, students choose a card and determine which comparing symbol to use. 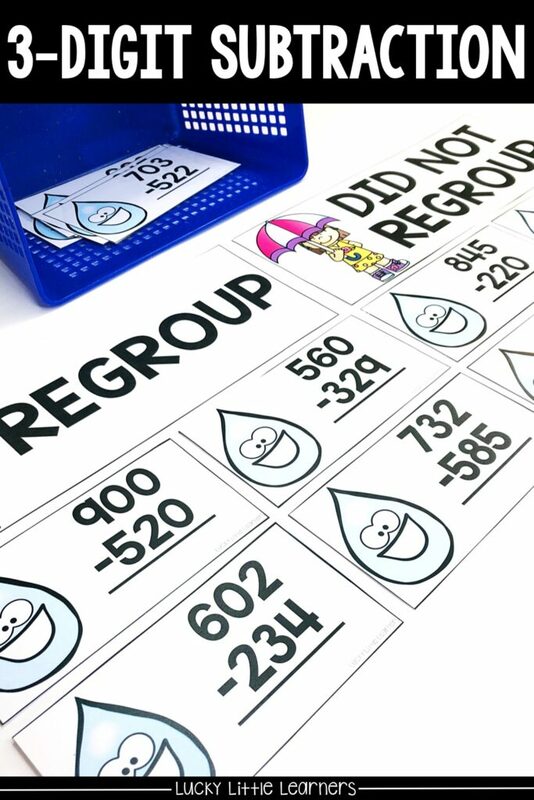 Students can use a dry erase marker (center should be laminated) to write the correct symbol. Then the student writes the answer on the recording sheet. 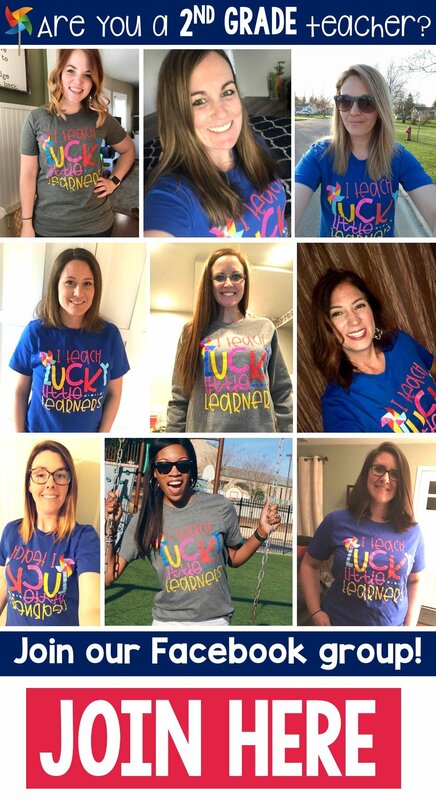 If you found this post helpful and would like to save these ideas for future reference, please feel free to use this link or the image below to save to your Pinterest board. Your 2nd grade math centers amaze me! I love all things you create.